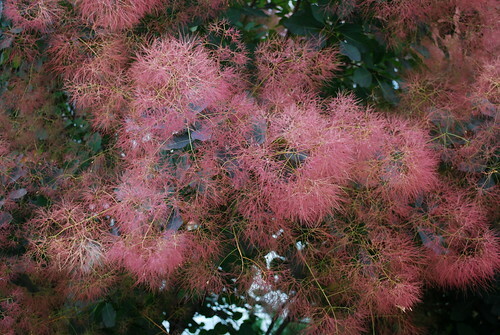 Cotinus coggygria or Purple Smoke tree as it commonly known is a wonderful ornamental shrub. I love it for its colors, and ability to grow in almost any soil and survive drought or a little neglect. Cotinus coggygria is recognized by its purple leaves that change many colors throughout the fall season. While the season changes from summer to fall, you can spot purple, red-orange and scarlet colors in foliage. The beauty of this wonderful shrub is enhanced when its flowers pop to produce plum-like clusters of seeds. These plumes give this beautiful shrub a hazy look (and of course the common name, Purple Smoke Tree) that adds charm to its colorful foliage. 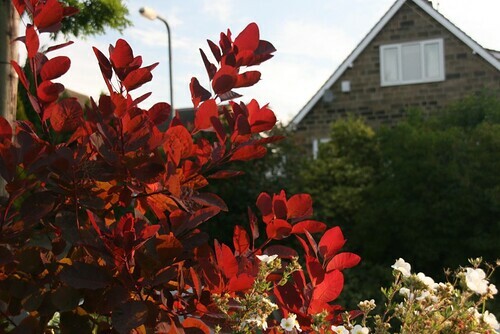 Cotinus coggygria can be grown as a hedging plant or a specimen plant in garden. It is usually propagated from softwood cuttings taken in summer or seeds sown in fall. The plant does not require much care and only requires a regular or slightly fertile soil under bright sunlight. It is a drought-tolerant plant and can easily survive long spells of drought making it a good choice when you are designing a xeriscape. Cotinus coggygria usually grows up to 4 meters but it can be easily pruned in early spring to keep it in desired shape and size. To encourage flowering, it is advised that you prune it in late spring. Popular varieties of Cotinus coggygria include C. coggygria ‘Royal Purple’ and C. coggygria ‘Velvet Cloak’. A number of other hybrids varying in size and foliage colors are also sold commercially.